Quite a game wasn’t it, with some fantastic goals, and a bit of controversy too! 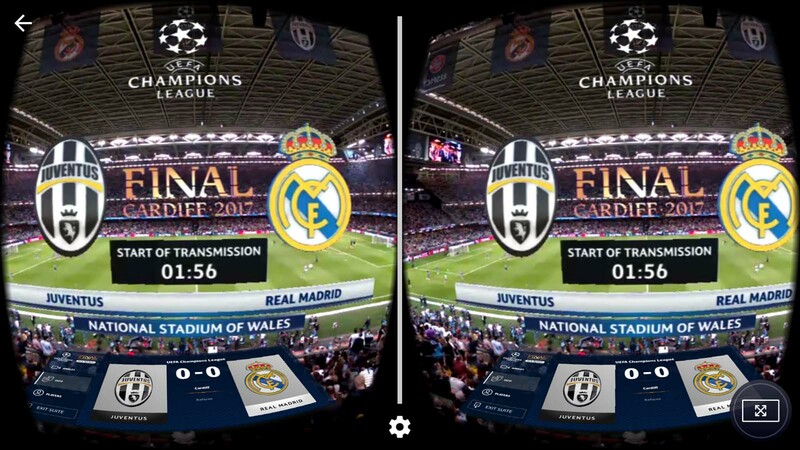 But this blog post isn’t really about the Champions League final, but about the VR experience that BT Sport offered. 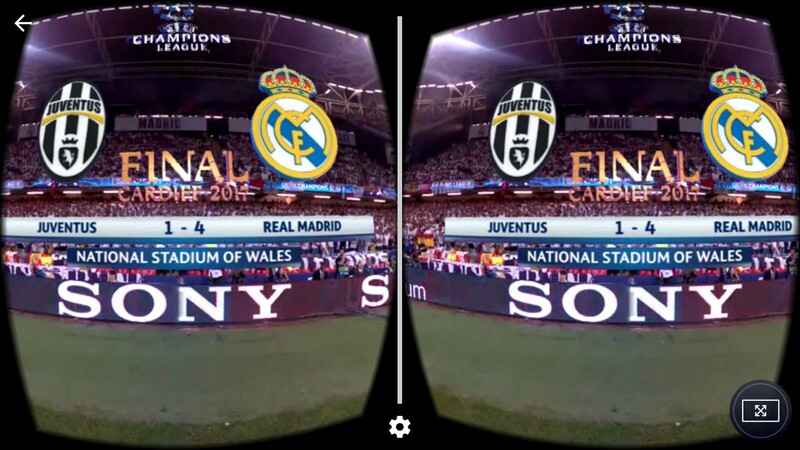 In my last blog post Watch the UEFA Champions League final in VR I looked at the past sporting VR content, and made some predictions and thoughts on how a VR experience could play out. 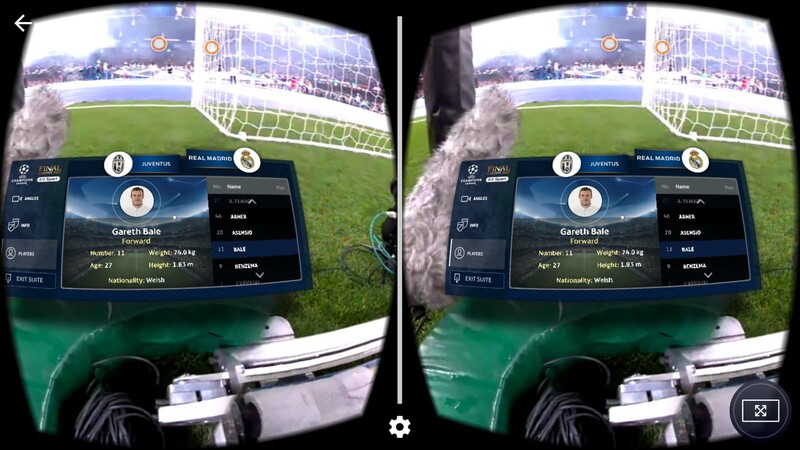 I was critical of BT Sports YouTube channel, and I hoped, but didn’t expect, that the VR experience for the final would be much improved. I’m glad to say my expectations were exceeded, and the final was enjoyable in VR! The experience begins with the BT Sport app. I’m a big fan of keeping as much as possible to the browser window (for speed, accessibility and convenience), but there are limitations, so downloading the small app was necessary. The app beings with a virtual environment, perhaps loosely based on a corporate box overlooking the stadium. There isn’t a lot to do here, other than have a quick look around and press the play button to load the live stream. 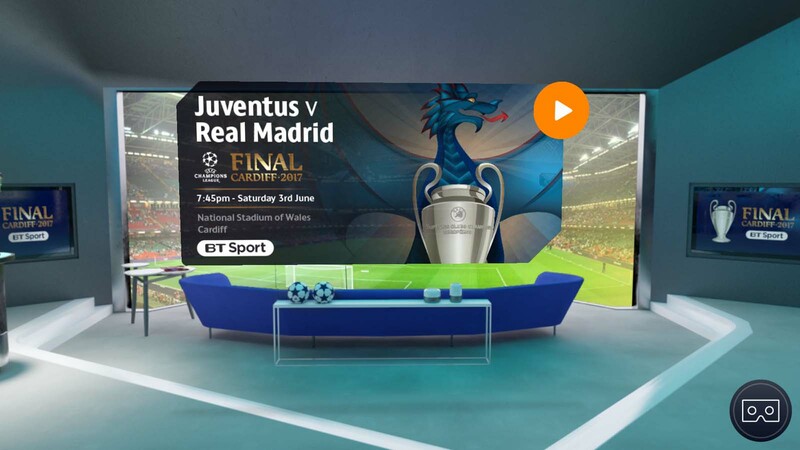 Once loaded you are transported to the stadium, and immediately you can see the difference in design, quality and experience from the YouTube VR clips. The build up and pre-match show for the final was also streamed, which was nice, but I think it would have been amazing if we could have seen something a little special. How amazing would it be to have a camera in the players tunnel, or even in their changing rooms? Maybe next time! The app sadly didn’t let us into the dressing room, but we could watch the match from 8 points around the stadium. The interface at the bottom of the view is very easy and straight forward to use, but does involve a lot of head movement to select your choice as the “cursor” is controlled by where you’re looking, quite annoying if you’re drinking a pint! Some of the view points are from the position of seats within the stadium, others are from positions closer to the pitch. You do get a feeling of being there, and it is nice to choose your view point. But I’ll be honest, the camera positions aren’t great, and you’re so far away from the action that it can be hard to follow the football at times. This is one of the pitfalls of football, you simply can’t place a camera in the middle of the action, which could be possible in other sports such as Formula 1. 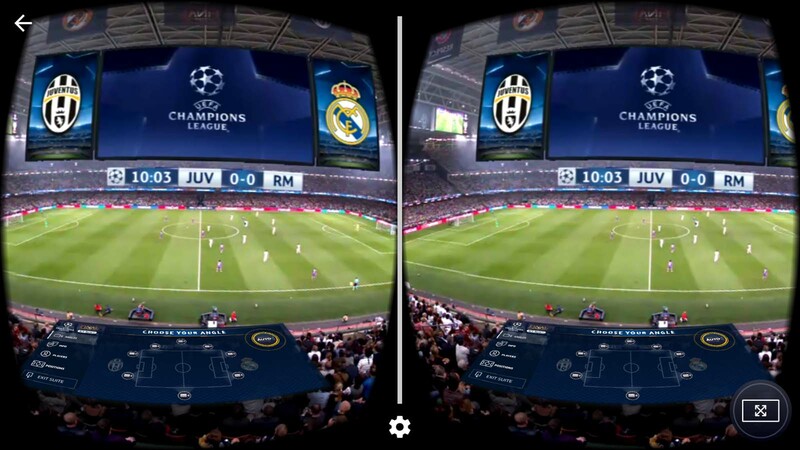 One nice feature of the VR app is that highlights of the match are shown on virtual screens above the pitch. This helps with keeping track of the action and anything we might have missed. We take highlights for granted when watching a match on TV, and without them it really does take something away from the experience. 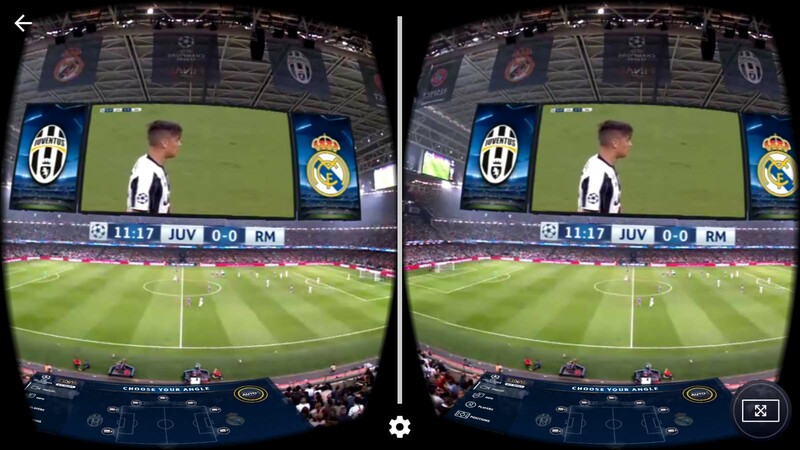 Now here’s a side thought, will we be able to watch a game in person, but with features like this for us to use via augmented reality technology? One notable and quite considerable frustration was with the virtual screens and commentary. To view the virtual screen and commentary you had to watch the game in “auto” mode, meaning the camera position was controlled by the TV station. As soon as you selected your own camera position you no longer had the virtual screen and commentary. I’m sure this is an easy fix, but it did take away from the experience. Other features are also incorporated into the app, but have little substance. Checking a players stats is nice, but do we really need to know Gareth Bale weighs 74kg? I would like to see live stats, that actually mean something during the match. How many passes did he complete, or how far has he run? All in all, I did enjoy the VR experience, and it did exceed my low expectations. Did I watch the entire match in VR? No. I wanted to get a flavour of what is currently possible, but my desire to enjoy the match took over, and I admit I watched most of the match on the TV. The camera positions were not better or worse that I expected. This is where the TV coverage is still leaps and bounds in front. Perhaps a zoom / virtual binoculars function would help? But perhaps we shouldn’t be comparing VR to TV. Instead we maybe should be comparing VR to being there in person. In that respect the VR option offers more flexibility, features, and is a whole lot less expensive! But does it really compare to actually being there? Well sadly no. 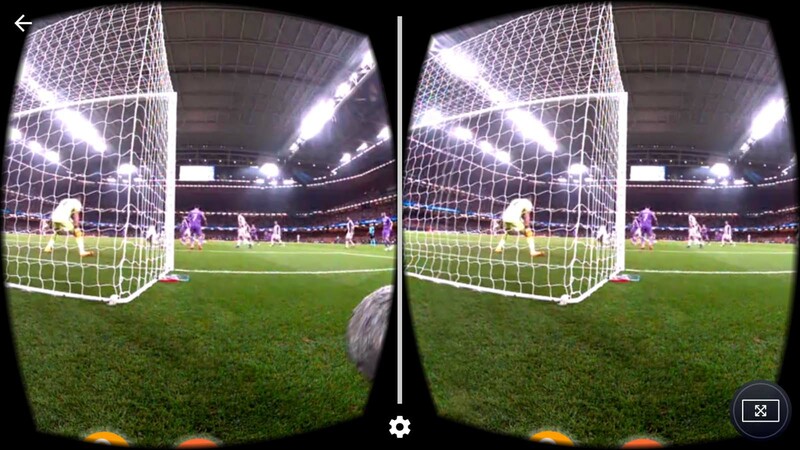 The buzz you get from arriving at a stadium, finding your seat, and watching the game with thousands of others isn’t really replicated in VR. It is immersive, and enjoyable, but it’s just not on the same page, yet. Virtual reality for football and sports is right at the beginning of its journey, and I did fear that it might be another giant flop like 3D TVs. However I’m slightly optimistic, and can see the potential to make the VR experiences brilliant. Firstly I think we need a way to make the TV and VR experience become one, or at least much closer. How can people be persuaded to ditch the 50″ LCD for a VR headset? What can VR do that TV doesn’t? Will TV always be one step ahead of VR? All tough questions, and I sadly don’t think there are any quick answers. But will VR replace going to the real event? This I’m really unsure of. The ability for VR to instantly transport you to anywhere in the world is a huge advantage. Time is becoming an increasing commodity, and in a society where life can sometimes feel too busy and exhausting, could VR be an answer? At the moment, I can’t see how VR could ever replace the buzz from going to a sporting event, and I don’t think this is a bad thing either. Going to a match is so much more than what you can see. It’s about the atmosphere, the noise, the people, the bad weather! Maybe one day we’ll fool our brains into digitally replicating these things, and stadiums will be filled with rows of VR cameras instead of people. I hope not, and I hope we can have the best of both worlds. Anyway, if you haven’t yet tried the BT Sport App, download it here for android, and here for IOS and have a go. Let me know your thoughts and ideas too!